THIS Danske Bank McDevitt Cup final was essentially won and lost in the opening half. St Joseph’s Coalisland played started facing into the breeze and led by 2-3 to 1-4 at the break, but they had to withstand a fierce fight-back as a determined Loreto Milford team chased them, score by score over the last half hour. 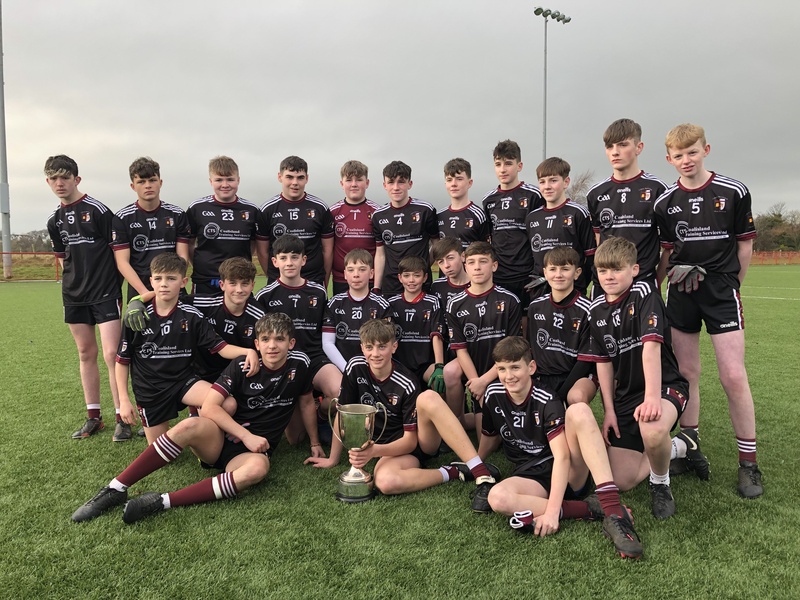 The win means that St Joseph’s will now have their name written on the Cup for the second time exactly 20 years on from their first success under the Vocational Schools’ banner in 1998, and they will thank goalie Daniel McAteer for a couple of important saves near the end. Other top performers on the day were Mark Duffin and Shane Hughes in defence and Conor Talbot in midfield, while all six forwards and substitute Jadon Morgan raised flags with pride of place reserved for Rónán Coney’s three goals and a point. But that tally was eclipsed by Milford full-forward Callum Cullen who hit all four goals and added a point for good measure. He had good support from Anthony Curran, Sean Coffey and midfielder Eoghan Quinn, but really their slow opening 30 minutes cost them the game. Coalisland’s battle with the wind was helped by a goal from a penalty after just ten minutes, Coney finding to the bottom corner and the same player neatly flicked home a second goal after 18 minutes following a length of the pitch move from his team. In between, Cullen had opened his account, but Milford faced an uphill struggle; having played with the aid of the breeze they were still behind by two points at the break. Although Shea Hamilton gave Coalisland the perfect start to the second half with a second minute goal, Loreto were soon back in touch with Cullen’s second goal closing the gap to 3-5 to 2-7 in the 44th minute. It really was a race to the finish line from them on, Rónán Coney managing to complete his hat-trick with Callum Cullen’s last two goals coming just a little too late. Loreto : T Cannon, C Gallagher, A Curran, J O’Neill, O Scanlon, C McMenamin, F Coll, E Quinn, P McDaid, S Coffey, R McGrenra, E McKeown, K Mallon, C Cullenn, E Scott.